Good news from the Far East. 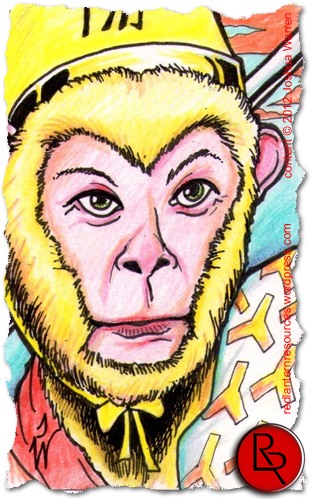 In the famous Chinese novel The Journey West a mischievous monkey named Sun Wukong turns the heavenly kingdom upside down. As punishment, he is banished and forced to live fused to a mountain, immovable, forever. After 500 years, he is released so that he can accompany Tang Xuan(san)zang eastward in order to procure numerous sacred writings. However, he isn’t granted total freedom. Instead, a golden band is placed around his head. Whenever he misbehaves, his master, Xuanzang, will recite a mantra and the band will immediately tighten, causing Wukong excruciating pain. Because of this, Wukong must “be good”. So what is Wukong’s dilemma? Personally speaking, Wukong seems to be a very appropriate personification of Buddhism, a system of religious thought that requires its adherents to live in conformity to the rules laid down by its founder and later “masters” — or else. Because of particular teachings, like karma, reincarnation, and a vast array of “hells”, the motives of even the most genuine adherents become suspect to accusations of selfishness and self-interest. That is, you do good things to increase your karma so that you can escape this “nightmare” called life. You avoid doing bad things so that you will not be punished in one of the numerous hells (Naraka) accordingly. So, Wukong’s dilemma could be summed up in a single question: Is Wukong serving his master out of genuine affection or fear of punishment? For that matter, are people executing religious duties out of a sincere heart or fear of punishment and retribution? What are your thoughts? What is your motivation, fear or love? This entry was posted in Buddhism-related articles and tagged Buddhism, China, Chinese novels, Chinese religion, christian, Christianity, 西遊記, Jesus, Sun Wukong, The Journey West, Wukong's Dilemma, 孫悟空, 悟空. ← Christianity and Economic Success? Hello. I hope you don’t mind if I wrote a response to you on my blog since I feel you made a number of errors in your understanding of the dhamma. No problem at all! I’ve read your response and I’ll think about it some more before responding. At this point I will say: Although I do live in a majority-Buddhism country, I will admit that my knowledge of Buddhism is lacking. One problem is knowing who can speak as an authority on its doctrines. Another is knowing which of its texts are authoritative. But thanks for taking the time to read and respond. I appreciate the engagement and if I think of something worthwhile, I’ll respond. Wonderful! Thanks for being willing to step out of your comfort zone. For me, I tend to refer to the Pali Canon of the Theravada schools. Other schools will use additional texts. The question of what is Buddhavacana is a tricky one, though I try to take an ecumenical attitude while acknowledging my own biases. A good place to start asking would be the local temple or university. Chances are good there is a dhamma expert there. Failing that, you can always begin reading on your own. There are many good websites available. I prefer Access to Insight, but again, I lean Theravadin. Please let me know if you respond.